Say no to say yes. As small business owners and as young entrepreneurs we face many challenges – some that business school and previous jobs prepared us for and some that we had no idea about. This year we’ve really learned the meaning of the power of saying No. 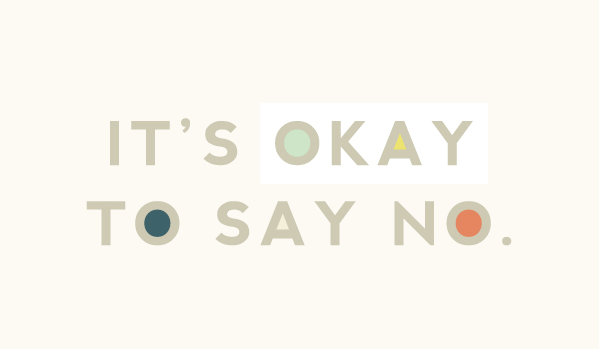 We have learned that we have to be more comfortable saying “No.” Yes, it’s really awkward (some more than others but that’s a whole different post.) Yes, we feel guilty. Yes, its hard to say “thank you but no thank you”. But if we have learned one thing this year is that, at the end of the day, saying “no” is better than saying “yes”. How can this be better you ask? Well it is better to say ‘no’ than saying ‘yes’ but not really committing fully to a project because it doesn’t grab us, fire us, or make sense for our life or schedules. At the beginning of our business we would say YES to just about anything and that act alone caused us so many growing pains and way more stress than we needed. We have now learned that saying ‘no’ to little opportunities and some big ones and at times our own ideas have left us open to say ‘yes’ to assignments that we are passionate about and interested in. Opportunities that push us creatively and take us into other business ventures that truly work for our style, passions, and personality. We’ve had to learn how to say No to potential clients – this was probably one of the hardest things to do but we’ve learned it and we do it with grace. We hope by sharing this with you; you can avoid making some of the mistakes that we made. Learn the power of NO and use it wisely.